Home | Publications| Encyclopedia | Watts, Julius Caesar, Jr.
(2012.201.B1355.0706, Oklahoma Publishing Company Photography Collection, OHS). WATTS, JULIUS CAESAR, JR. (1957– ). 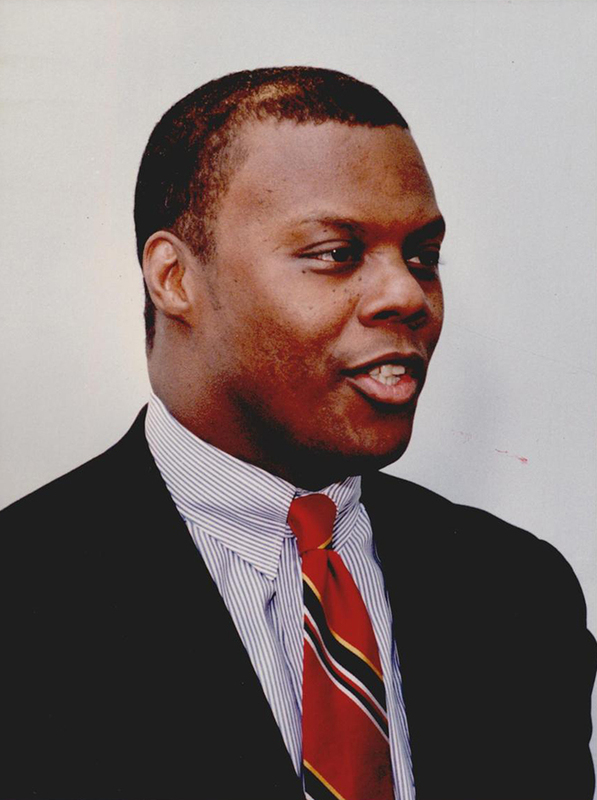 U.S. representative from Oklahoma in the 1990s and the state's first black congressman, J. C. Watts, Jr., was born in Eufaula, Oklahoma, on November 18, 1957, to Helen and Julius C. Watts, Sr. The Watts family were politically active. Watts, Sr., a farmer, was a town council member, and his brother, Wade Watts, was state president and executive director of the Oklahoma NAACP. The future congressman graduated from high school in his hometown in 1976 and attended the University of Oklahoma, playing quarterback for the Sooner football team and leading them to two conference championships and Orange Bowl victories. He graduated in 1981 with a degree in journalism. He played for five years for Ottawa and Toronto in the Canadian Football League, receiving the most valuable player award in his first season. Returning to Oklahoma in the late 1980s, he worked as a minister at Sunnylane Baptist Church of Del City. Meanwhile, he began a career in politics and was elected to the Oklahoma Corporation Commission, serving from 1990 through 1994 and also as the commission's chair. In 1994 he successfully ran as a Republican for a seat as U.S. representative from overwhelmingly Democratic and white District Four and served from January 1995 through January 2003. While in Congress, he chaired the Republican Conference, the party's fourth-ranking leadership position in the House of Representatives. He also served on the Armed Services Committee, the Military Personnel Subcommittee, and the Procurement Subcommittee. Resigning from Congress in 2003, Watts formed J. C. Watts Companies, which provided marketing and business development services. He is the author of What Color is a Conservative? My Life and My Politics (2002). Watts has served on board of directors of Dillard's Inc., Burlington Northern Santa Fe Corporation, the Boy Scouts of America, and the United States Military Academy at West Point, New York. He headed the U.S. delegation to the Conference on Racism, Xenophobia and Discrimination hosted by the organization for Security and Cooperation in Europe. His career has also included serving as a commentator for Nation Public Radio's Tavis Smiley Show, as senior distinguished fellow at the Mercatus Center in George Mason University, and as cochair of the Coalition for AIDS Relief in Africa. Oklahoma Almanac, 1997–1998 (Oklahoma City: Oklahoma Department of Libraries, 1998). "J. C. Watts," Vertical File, Research Division, Oklahoma Historical Society, Oklahoma City. Dianna Everett, "Watts, Julius Caesar, Jr.," The Encyclopedia of Oklahoma History and Culture, https://www.okhistory.org/publications/enc/entry.php?entry=WA046.